Raw cookie dough is not something I’ve been tempted to eat. Nor do I like cookie-dough flavored foods like ice cream. But this Cookie Dough Dip is mighty tasty. It’s especially great when you want something on the sweet side but would rather not dive face first into a box of fried donuts. 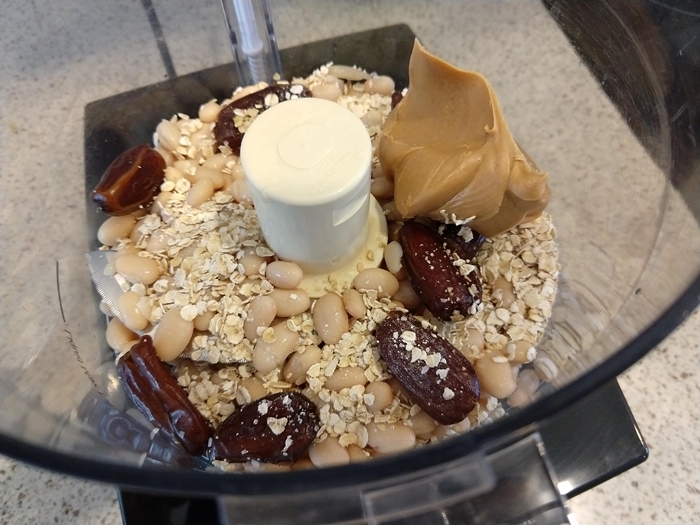 Not only is this delicious, but it does provide nutritional value: it’s fiber rich (from the beans, dates, peanut butter) and has healthy fats. Yes, I said beans — don’t let that put you off from trying this recipe. Rinse them thoroughly and you’ll never know they make the base of this tasty dip. 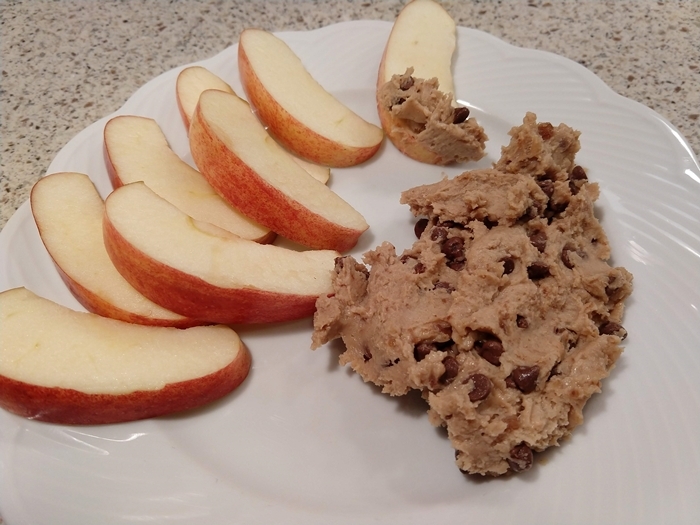 The Cookie Dough Dip isn’t cloying sweet, has a great a texture, is quick to prepare, and is inexpensive. And perhaps best of all, you can find all the ingredients at your local grocery store. No expensive, hard-to-find foods here. Add all ingredients, except the chocolate chips, into a food processor. Cookie dough ingredients in the food processor. Seems like an odd combination of ingredients, I know. But just try it. Blend until it’s a smooth consistency, adding the milk as needed. I start with two tablespoons and add the third and fourth if the mixture is too thick after blending for about one minute. Blend for about 2-3 minutes, scraping down the sides and along the bottom a couple times to make sure everything is incorporated evenly. You shouldn’t see chunks of dates. After the mixture is smooth, transfer it to a bowl, add in the chocolate chips, then stir to combine. Cover the container and pop it in the refrigerator for at least a few hours before eating. Serving suggestions: I prefer to eat the Cookie Dough Dip with apple slices; bananas are good, and so are pretzels. An old tennis shoe may taste good too when it’s slathered with a thick smear of the dip, but I can’t say I recommend it. Eating it straight off a spoon works great as well. *If a different nut butter, like cashew or almond, tickles your fancy, you can use it here. I use peanut butter because (a) it’s dang delicious and (b) it’s cheap. *Why dates instead of some type of sweetener? I tried honey once, then went back to using dates because I enjoy their flavor and think they work much better in this recipe — I like the sweetness they add without taking away from the “cookie dough” taste you’re after. 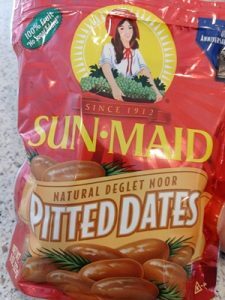 You can use a different sweetener, but I recommend trying the dates first. *Use any type of milk you prefer. I use regular milk. You know, the kind that comes from cows. But if you fancy almond, soy, cashew, any other nut juice, rice or oat milk, use it here. Do foods like this tempt you to eat the entire container? Yeah, me too. If you tend to overeat foods like this, or you’re greatly tempted to do so, do yourself a favor and divide the dip into individual-sized portions. This way, when you want some Cookie Dough Dip, you get a single-serving container and can enjoy it without testing your willpower to … stop … eating … so … tasty. After combining the chocolate chips with the dip, divide it into 8-10 individual-sized portions and keep them stored in the refrigerator. While you’re here, join the newsletter. You’ll get updates for the latest content and receive insider-only information. Enter your email below.